The Wanderlust Dream: a longing for a life filled with travel, of following your inner compass – and that compass points to the sea. 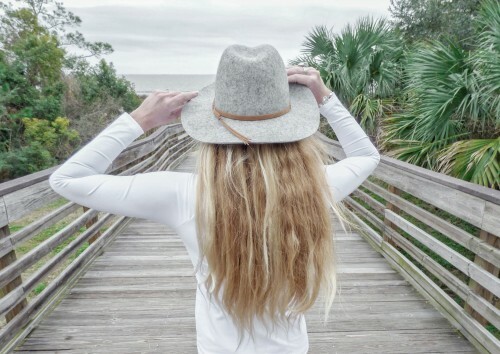 Saltwater in your hair, blue skies up above, and the open road before you. Siren Williams is the embodiment of that dream: a surfer, traveler, and songwriter that treats each day as an adventure. On her latest expedition, Siren packs our Lace-Up Rash Guard and gives us an inside look at her free-spirited philosophy. You live a great part of your life on the ocean and the open road, what do you think it is about travel that captivates you? I could sit and talk about my travels for days… I am passionate about travel because I have loved geography since I was a little girl, and I love learning new cultures. I love moving around a lot, experiencing and photographing new places, learning the local language and getting involved with local families and communities. As a competitive surfer, you’ve clocked a lot of time on the water. What is one of your favorite memories from a day spent riding the waves? I have so many! There’s nothing like watching a shuttle launch into space while you’re paddling out into a thick school of dolphins swimming all around your board, or being stalked by the largest bull shark you’ve ever seen in 3 ft of crystal clear water. One of my favorite memories has to be while surfing St. Andrew’s State Park and the dolphins were surfing the waves with us. A few hung around my board for a while and would jump and land on their sides, splashing me repeatedly. It was so amazing and I think they were having as much fun as we were! How did you learn to surf, and what led you to surfing on a competitive level? I started surfing when I was around 12 years old on Cape San Blas, Florida. I was sort of talked into giving it a try by a few of my guy friends at the time, and I’ve been surfing ever since. When I moved from the Florida Panhandle to the East Coast back in 2007, I began teaching surf lessons full time and began competing in local contests. It was in Cocoa Beach that I started competing regularly and began traveling the state for contests. I still love competition and I’ve been doing more professional longboard contests in the last several years, but I’m currently on a bit of a hiatus, as I’m finding that performance can sometimes ebb and flow. You’ve come to call Florida home, what places would you recommend a tourist visit as a must-see in your neighborhood? Born and raised in Florida, and growing up living in Florida’s state parks, I grew up in an environment that supported conservation of “Real Florida.” I recommend my hometown of Apalachicola, Florida, where the Cattahoochee/Apalachicola River meets the bay. St. George Island has beautiful beaches just over the bridge. The small, historic town has eclectic shopping and a great historic theater, with lots of history and culture. Apalachicola is also the oyster capital of the world. The surrounding area has caves, springs, and Native American history. Second, I would say the Florida Keys for a quiet get-away with beautiful water and sailing tours. Third, I’d recommend doing some air-boat tours on one of our small inland rivers to experience a side of Florida that most people don’t realize even exists. Beaches are always a short drive away, no matter were you stay. As an experienced traveler, often by way of VW bus, what are your top three travel locations? I lived in Morocco for five months and worked as a surf instructor and photographer there. There were always waves, plenty of right-hand point breaks, and the culture was amazing. Next on my list would have to be Australia. I spent one month there about ten years ago and it was really incredible how diverse it was, with rain-forest and beaches, cities on rivers, mountains, and lots of undeveloped land. The people there are absolutely amazing and really co-exist with Mother Earth in a respectful way. I’d say that the Virgin Islands are third on this list. I lived there for a while and was lucky to have a small boat at my disposal on most days, which really makes all the difference in the world. Island hopping and taking the boat to surf is really a great experience. We explored and camped on small, uninhabited islands with views that could hardly be dreamt of. Frequent traveling must cause a lot of negotiating on what items to take with you. What is the one thing you can’t leave home without? The one thing that I always MUST have is a bikini. Even if I’m going to the middle of America, I must have swimwear! I generally pack anywhere from five to ten bikinis on average. Shop the look at WALA SWIM. Find more inspiration, elevated design, and aquatic couture by following our Instagram.